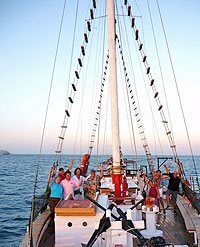 Charter this historic tall ship for your group event in Cabo San Lucas! This classic twin-masted wooden brig seats up to 60 people comfortably and is perfect for snorkeling trips, dinner cruises, sunset cruises or whale watching trips. There is bench seating on the main deck, plus limited additional seating inside the main cabin, and there are two restrooms on board - mens and womens. Cabo Legend features an available pirate theme, complete with your favorite pirate crew and pirate themed fun, or you can opt for a traditional style event without the theme, the day or night is up to you. There is a wide deck with plenty of space for dancing if you are looking for a party cruise, and easy entry to the water for a snorkeling trip. Cabo Legend is also popular for dinner cruises. See below for some suggested itineraries for this boat. Cruise Passengers: Yes! This exclusive private charter is perfect for a cruise shore excursion! This charter is flexible to fit all cruise ship schedules..